Men are at work in front of Nijubashi (皇居二重橋) at the Imperial Palace (皇居) in Tokyo. They are either installing electricity or telephone lines. 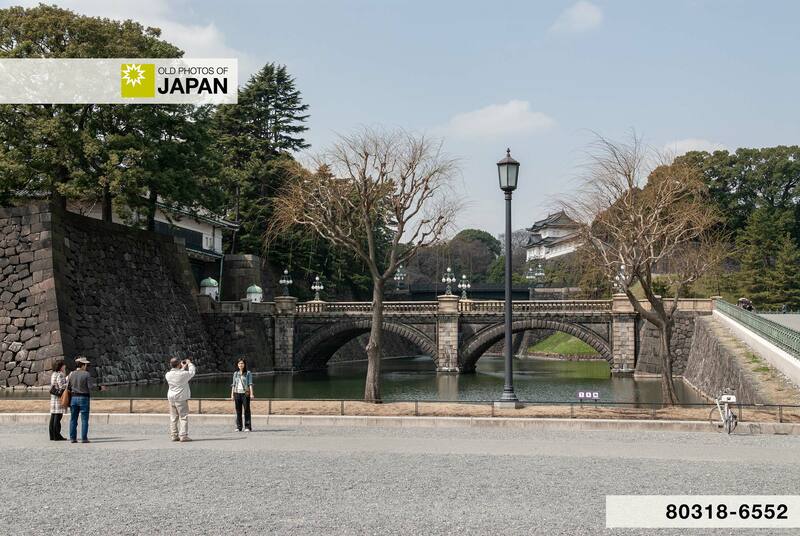 The Tokyo Imperial Palace, located nearby Tokyo Station, has been the main residence of the Emperor of Japan since Emperor Meiji (1852- 1912) moved here from Kyoto in October 1868 (Meiji 1). It contains a large number of buildings, including the private residences of the Imperial family. Until Emperor Meiji moved in, it had been the residence and headquarters of the Tokugawa Shogunate and was known as Edo Castle. On May 5, 1873 (Meiji 6), the old Edo Castle was destroyed by fire. 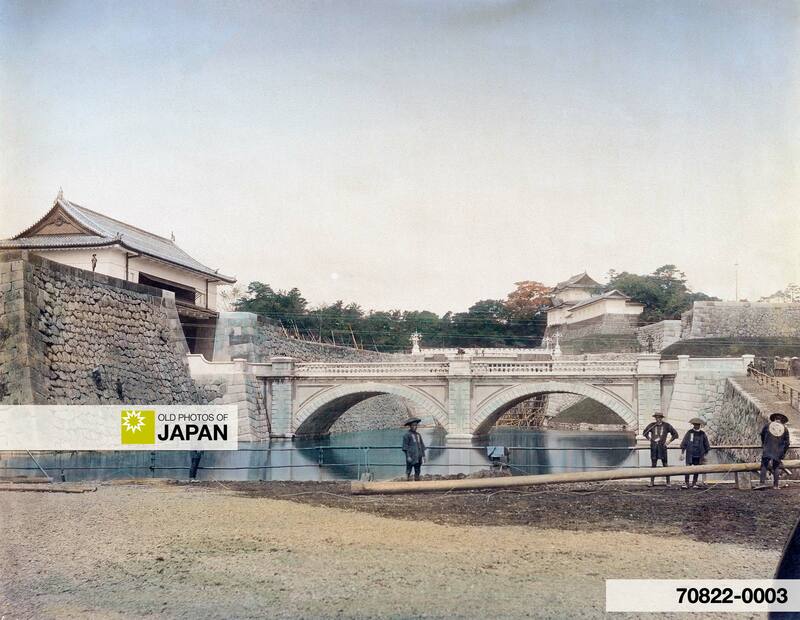 The new Imperial Palace Castle was built in 1888 (Meiji 21) on the site where another structure had burnt down in 1657. During the Meiji Period (1868-1912), the majority of the surviving Edo Period structures dissapeared one by one. Some were torn down to make way for new structures, others were destroyed by fire or earthquakes. Among the structures that were replaced, were two wooden bridges known as Nijubashi. In 1887 and 1888, they were replaced by the stone and iron bridges on this image. Part of the iron bridge can be seen just above the stone one. It featured beautiful ornamental lamps, one of which has been preserved at the open-air architectural museum of Meiji Mura in Aichi Prefecture. At the back of the stone bridge —often called Meganebashi (Spectacle Bridge) because of its form—, the Fushimi turret (伏見櫓, Fushimi Yagura) can be seen. It was transferred from Fushimi Castle in Kyoto, therefore its name. During the Edo (1603-1868) and Meiji Periods, the bridge in the foreground was called Nishinomaru Ote-bashi (西の丸大手橋), while the one in the back was called Nishinomaru Shimojo-bashi (西の丸下乗橋). These days they go by the less poetical names of Imperial Palace Main Gate Stone Bridge (皇居正門石橋) and Imperial Palace Main Gate Iron Bridge (皇居正門鉄橋). Although tourists are allowed to come as close as the entrance to the stone bridge, both bridges are closed to the public. Twice a year, though, exceptions are made and they are opened to the public: on January 2, and on the Emperor’s birthday, which these days is on December 23. This democratic gesture was started in 1948 (Showa 23). You can also licence this image online: 70822-0003 @ MeijiShowa.com.